Absolutely ideal for both travel and work, either bringing one charger for two devices on holiday, or leaving a convenient charger at work so you don't need to carry one. Guaranteed compatibility with your laptop as well as our money back guarantee on our laptop charger! :-) Enter your laptop make and model, and we'll handle the rest. Works across all major laptop brands including Apple MagSafe laptop heads. Also charges your mobile phone or USB device! Simply use your own charger or select your model at checkout and we can send you one. Unlike cheap OEM chargers, we meet and exceed both European and UK manufacturing and safety standards. Laptop charger UK based store, local and fast shipping. The market is saturated with two types of laptop chargers: cheap and terrible, or expensive and okay. There are places where you can buy a cheap, tacky charger that meets no manufacturing or safety standards and ships from outside of Europe, for relatively little cost. Unfortunately there's no guarantee the charger or even your laptop is safe with one of these. The reason the cheap ones exist is because the decent chargers are also overpriced! Look at the official Mac laptop chargers, or high street stores that sell decent universal laptop chargers for £80 or more. This is where we come in at Imperial Gadgets: we think both are possible. Our universal laptop adapter is compatible with both PCs and Macs, including Apple's MagSafe laptop charger tips. 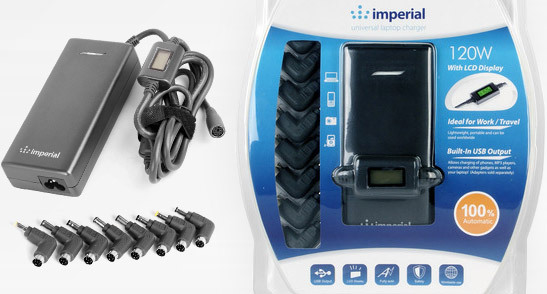 Unlike cheap generic chargers, we also meet and exceed all European and UK manufacturing and safety standards, protecting your charger and laptop from power surges and other errors. Automatic voltage switching also means you can't accidentally feed your computer the wrong amount of power (again, something cheap laptop power supplies don't have). Ultimately, however, we're able to provide what most high street stores sell for more than £80 and in some cases over £100, for half the price. We are an online-only business and believe that by keeping our costs low we can pass this saving onto our customers. So come on in, and give us a try. Our laptop charger UK online store stocks a premium quality product, at a deliberately less-than-premium price - and we have good customer service to back it up as well! Having a good universal laptop charger is fantastic for both people that travel and those that transport their laptop to and from work / home often. For those who enjoy travelling, it is often useful to have a single charger that charges two devices. You only need the one plug converter when you arrive at your destination, and if you buy laptop charger from us you'll see our USB port is on the charger brick itself, meaning you can charge your phone independently and without a second power point. The entire charger unit also weighs in at just over 900g, so despite it's advanced safety features it's not heavy. Workplaces are increasingly using laptops rather than desktops, and bringing your computer home with you can often be annoying if a charger and various attachments also have to be brought. With one of our universal laptop chargers, you can leave a charger either at work or at home, so that you don't have to transport a laptop power supply with you. Our laptop adaptor also fits both your home and work laptops, making switching between them easy. Finally, remember that our laptop charger UK shop ships all our products from the UK, and we aim to serve with a great customer experience.